In 2012, UC launched the Red Folder Initiative.Under this initiative, each campus committed to publish a "Red Folder" to serve as a quick reference guide to mental health resources for faculty/staff and graduate teaching/ research assistants who may interact with distressing or distressed students. 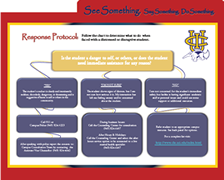 The customized folders identify common signs of student distress and direct faculty/staff and graduate teaching/research assistants through campus protocol to clarify who they should contact in the event of an emergency. The folders also provide tips for how to approach a student who may be in distress and connect that student with the appropriate resource. Distribution of the folders is often accompanied by a brief training from the Counseling Center staff. Contact your Counseling Center to schedule training and/or receive copies of your Red Folder publication. If you are from outside the UC system, see links below for samples and feel free to modify our resources for your own community.